If you’re a publisher whose inventory is being bought through one of the major DSPs and you haven’t already implemented ads.txt, implement ads.txt NOW. We’ll tell you why. One of the biggest DSPs has just announced that starting in Q2 2018, its advertisers will have the option to target only eligible inventory that includes an ads.txt file. 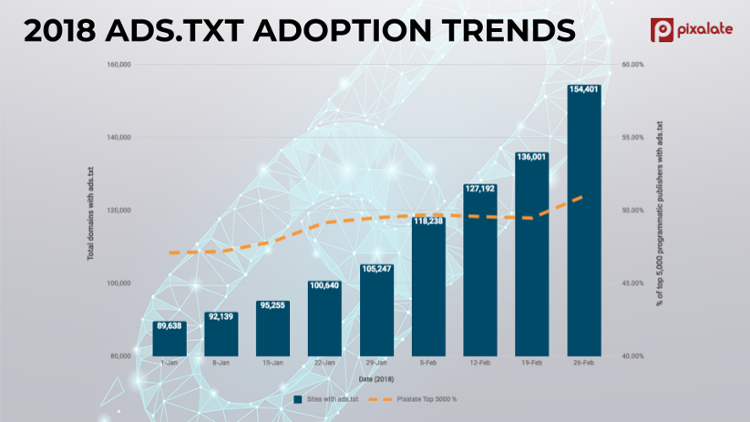 They’re expecting large numbers of advertisers to take advantage of this option, which means publishers who implement ads.txt will continue to see the benefits. Those who haven’t will most definitely lose revenue. By now, almost all publishers have at least heard of ads.txt, even if they’re not exactly sure what it is. Definition reminder: Ads.txt prevents bad actors from tricking buyers into purchasing fake impressions. Available on desktop and mobile web, it lets publishers declare which companies they authorize to sell their digital inventory. Ads.txt implementation is growing fast amongst publishers; Pixilate has reported that over half of publishers have added the file. This makes ads.txt one of the fastest growing — if not the fastest growing — IAB standard yet. The demand side has taken a bit longer to jump on board, but the biggest DSPs have already done so. Others will soon follow suit. Publishers who want to continue to see revenue growth will need to adopt ads.txt as soon as possible. Why Is this DSP Announcement a Big Deal? There are two reasons this DSP ads.txt targeting feature is big news. 1. It’s proof that DSPs are taking ads.txt seriously. These players started to filter inventory with ads.txt a few months ago, but they’re going a step further by allowing buyers to target only inventory with the ads.txt file. Publishers who haven’t implemented ads.txt are already losing revenue. Once advertisers start ads.txt targeting in Q2, these publishers will certainly lose even more. 2. If you’re a publisher who still needs to implement ads.txt, check out our video “How to Implement Ads.txt in 3 Minutes”. If you’ve already implemented it, check your file to make sure there are no mistakes. A file with errors is just as bad as no file at all.